Creating new content takes an incredible amount of time and resources for your internal teams. Maybe you’re even paying an agency a good percentage of your budget to do it for you. Whilst content, from blogs to eBooks, and videos to white papers, does have a lot of value, that value comes at a cost. This isn’t the only issue with generating new leads through content. The effectiveness of sharing content via email is declining, it’s harder than ever to connect on the phone, people are apprehensive about immediately giving out their contact details, and social media has become more about likes and less about real results. In short, creating content to generate leads can be challenging, time consuming and expensive. But, what if you didn’t have to spend time and money creating content in the first place? 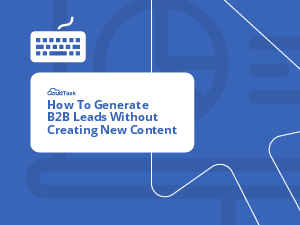 What if you could generate qualified B2B sales leads without it?